Names of new project and solution you can choose by yourself. I’v use “SCSMControl” as an example for this article. After create new project you must change name of the class and name of the control. At the next step you must add ContentProperty attribute to the control’s class. These attribute use in real control to set the default property (Text for TextBox, User for UserPicker and so on). But in case of current control you can use any property as attribute value. To accomplish this task we must create new property for our class with DependencyProperty. This property we will use as value for ContentProperty attribute. Type and name of the property can be any. I’ve choose “SelectedItem” of string type. Also this property must support both public “set” and “get”. At line 3 you can see the ContentAttribute which refers to SelectedItem property (this property defined at line 15-26). I’ve added INotifyPropertyChanged interface. That interface provides support to handle changing value of our property by over control on form (in current project this is unnecessary but can be helpful in the future). And also I’ve show you show we can handle changing property inside of our control with PropertyChangedCallback. Both approaches added only as an example of different techniques and doesn’t require to you use them. Technically, now we can add our control to SCSM’s form, but control still didn’t do anything useful. Let’s display some data inside this control. To do that we must use powerful mechanism of WPF: binding. But reasonable question – what is the names of properties we must use to bind? If property are not simple (enum, type projection component and so on) the property value’s also return the IDataItem type (line 3, 4). Here you can see several different methods of binding. In first case (line 1, 2) we bind directly to simple properties. “$Id$” is a internal id of current object (Guid). Line 3 shows you how to set text when property has no value (note: this is NOT a default value). Line 4 shows you how to bind to a control’s property. “$IsNew$” property is a “true” when form opened for creation and “false” for editing. As you can see, we can mix IDataItem and standard SDK objects to set values (line 13). Now our control is ready to use. 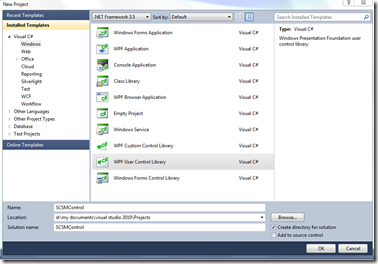 The link to Visual Studio 2010 project you can find at the end of this article. Create new form customization. That already described many times (here, here and even with video here). Save management pack and then open it at any text editor. Find “Forms” section and added control inside here. sn.exe –T <assembly path> (sn.exe utility located in c:\Program Files (x86)\Microsoft SDKs\Windows\v7.0A\Bin\). Also you can add this command as tool in Visual Studio to easily find Public Key. Add values for control’s property with <PropertyChange>, if necessary. Now we must copy assembly to all computers with SCSM’s console installed. It can be easily done manually when you have 3-4 computers with SCSM console. But what if we have 50 or 100 or even 500 computers? And how update our assembly later? It can be nightmare for administrator. But the developers of SCSM took care about this. SCSM use management pack bundle to deliver the resources. This bundle may contains sealed or unsealed management packs and several types of resources such as assemblies, images, scripts and etc..
%MPVERSION% – version of management pack which contain the reference. This bundle we must import to SCSM. that mean what form already have been customized in over management pack. Delete that MP from SCSM and reimport your MP. then you must check the existing of ContentProperty attribute. 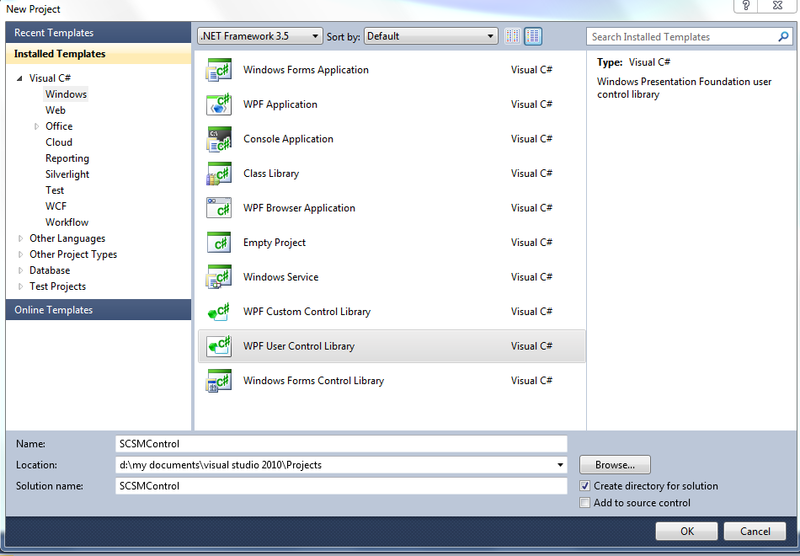 Read-to-use Visual Studio 2010 project, management pack and bundle you can download here. Thanks, Anton, this is a really excellent example. This is the one thing I’ve not been able to do with Service Manager and thanks to your guide I now have it working. Cheers, Rob. I am gettin an error while i try to associate the assembly to custom form .The error say as form could not be loaded:specify the path of the assembly/system error.I created the dll using Microsoft Visual Studio.Your urgent help on this would be highly appreciated..
System.ArgumentException: ‘Grid172’ Name is not found. I don’t have a grid called ‘Grid172’. Can you please point me in the right direction? Evrything works fine when opening an already registered Incident. This is for SCSM 2012 or SCSM 2010? What is Parent element for your custom control? Parent for my control is grid211 and the version of SCSM is 2010. The problem is occuring the second time when I create a new Incident, the first time it works fine. Opening already created Incidents is working perfect. My feeling is that something ain’t getting removed or disposed in the User Control. But I can’t see why or what. Hmm.. Grid172 is a root Grid of the entire IncidentForm control. BTW. There is no Grid211 on the Incident Form. Maybe you mean StackPanel211? I think the problem only occurs when I click “Apply” not when I only click “OK”. It seems that it reloads the form twice when I click “Apply” and then me error occurs. I want to add a Sortable ListView to the form ComputerCI. A listView with a list of Application CI (Relation AssignedApplication2Computer), just like we have the listView of InstalledSoftware; with the 3 buttons(add,delete,open)that opens a Application selection form. Any idea how I can do this ? You should do all of this manually. Create new control, add SortableListView, buttons and write events handlers. It works when I create an MPB as documented, but not as MP (SCCM2012). Also, When opening the form I am getting a file not found exception for my new assembly, where does the .dll file need to be placed for this to work? Please read the “Delivery assembly” part. I’m facing a problem and I need your help. Error creating control type SCSMControls.SCSMControl. Could not load control assembly: SCSMControl, Version=1.0.0.0, Culture=neutral, PublicKeyToken=70d14d588666d034. Please verify that the assembly version and key are correct. The system cannot find the file specified. Sounds like your MPB doesn’t contain the assembly. Try to check your MPB and\or re-bundle it. I have the exact same issue. The dll is bundled and is copied to the AppData folder, but I get the same error. I have used the delivery assembly section as advised, the dll file appears in the correct sub folder of AppData as expected, but still I am getting the file not found exception. Your help/advice on this would be greatly appreciated. thank you for your article. It was very helpful. But I want to do something more and I didn’t find how to do it. I need to bind a checkbox and also a combobox which its source is a List I have created in a custom management pack. Can you tell me how to achieve that? Yes, it’s work with 2012. Try to check your enum’s ID with SMLets. First, thanks for the walkthrough and explanation, it is very educational. Second, would you be able to clarify further the usage of the ContentProperty attribute? I have a custom control I am trying to get working, but my results repeatedly end up similar to your ContentProperty attribute mis-configuration screenshot above. I should note that I am a beginner at C#, which is probably part of the problem. My custom control is very straightforward – it is simply a table of text boxes, checkboxes, and datepickers which are defined and bound within XAML, intended for use as an extension to the Incident form to display properties for a set of extended Incident class properties. When I attempt to add the control to the existing Incident Form, all it appears as is a small, content-less box displaying its name. I’ve attempted to reverse-engineer what the code-behind would need to be in order to get it to display properly, but I’ve had no luck. Could you advise me on what might be needed in order to get my control to work? If i Import your mpb it works fine. But when i rebuild your mpb with your dll and your XML file, i get only the “SCSMControl_1” Placeholder. Im Using SCSM 2012 R2. I dont used VisualStudio, yust the dll in the bin folder from your zip-file.